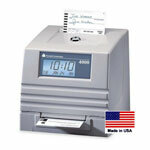 Excellent biometric time clock system from Amano USA. 100 employees, 2 supervisors, network fingerprint time clocking system. Read more about it here. Amazing value. 100 Employee Network/USB/ThumbDrive Amano TimeGuardian Proximity time clocking system with expandable TimeGuardian software. 100 employees per pay period. New, faster printer, most modern design. Supports weekly, bi-weekly, semi-monthy and monthly pay periods. Basic starter system for manufacturing or schools: One timer, one bell, and one digital clock. Add more bells, more clocks, as needed. Signal Controller that rings bells also controls Digital and Analog Wall Clocks. This is DC, however you may use your existing AC system if you like! We can show you how. Discontinued. Replaced by the Pyramid 5000. We stock the supplies!